JDP offer both extruded and woven polyester geogrids, which are widely accepted as giving the best performance and longer lasting results for soil reinforcement. Mono-orientated geogrids (strength in one direction) offer the ideal solution for the construction of embankments and earth walls that are stable at inclinations of up to 80°. Bi-oriented geogrids (strength in both directions) offer extremely high performance making them suitable for embankment foundations over soft soil; they are widely used in road construction, so they can also be found in our Road Building Products section. Woven geogrids offer high strength at low elongation and are available as bi-axial geogrid (strength in both directions) and as a uni-axial geogrid (strength in one direction). These geogrids offer a cost saving against extruded geogrids where such high performance is not required. Whatever the nature of your project, JDP can give advice in selecting the appropriate product and offer cost effective solutions. Available in a range of tensile strengths beyond 120kN/m2, this product minimises environmental impact by allowing the use of poor quality in-situ fill material and encouraging slope back to its natural vegetated state. 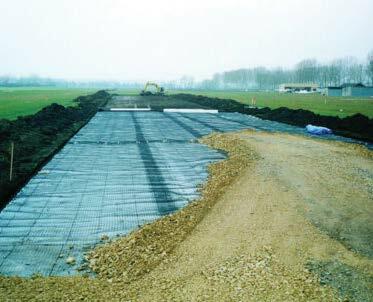 A non woven geotextile combined with a bi-oriented geogrid makes a separation and stabilisation product which avoids mixing different soil types whilst providing effective filtration and high strength.